Dorsal view in fall showing smaller, dark green turions protruding from lateral budding pouches. Overwintering turions of Spirodela polyrrhiza. 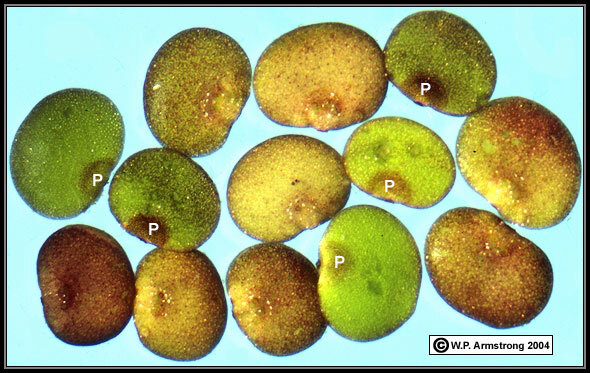 They may appear like lima beans in this photo, but they are actually small, rootless plant bodies only 1-2 mm in diameter. The darker area at the base of each turion (P) is the dorsal or ventral lobe of the prophyllum (depending on the orientation of each turion). Generally, the transparent prophyllum is more evident on the lower (ventral) side. The scalelike prophyllum is a structure unique to the genera Spirodela and Landoltia. The starch-filled turions have a specific gravity greater than 1.0 and sink to the bottom of ponds and lakes during the fall. They remain at the bottom during the winter months while the surface of the pond is frozen over. During the spring, after the ice has thawed, the turions rise to the surface and germinate into a new population of Spirodela plants. Turion of Spirodela polyrrhiza. Note the minute, transparent, bractlike leaf called a prophyllum at the basal end. The prophyllum overlaps both the dorsal and ventral sides of the turion, but is more visible on the lower (ventral) surface. The prophyllum of Landoltia punctata is much smaller. If the prophyllum is homologous to a leaf in its embryonic origin, then it is certainly should be recognized as one of the world's smallest leaves. A germinating turion of Spirodela polyrrhiza. After overwintering on the bottom of a pond, the starch-filled turion rises to the surface in the spring and produces a daughter plant at its basal end. The daughter plant (frond) reproduces by budding to recolonize the surface of the pond. This is esssentially how this duckweed species can survive in very cold regions where lakes and ponds freeze over during the winter months. 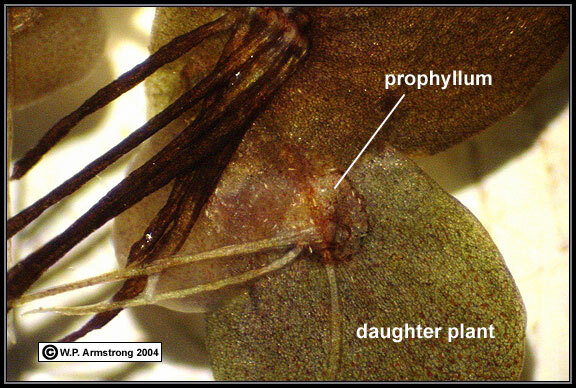 Underside of a hydrated herbarium specimen of Spirodela polyrrhiza showing a small, scalelike prophyllum at the basal end of a daughter plant. This species has 7-12 or more roots, with one or two roots passing through the ventral prophyllum. Most of the roots are outside the margin of the prophyllum. The prophyllum is more evident on young daughter plants. 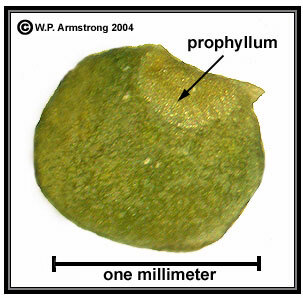 Spirodela and Landoltia are the only duckweed genera with a prophyllum. 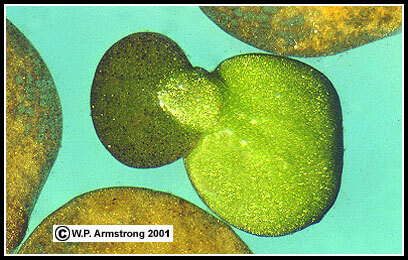 This scalelike, basal leaf is absent in the more advanced genera, including Lemna, Wolffiella and Wolffia.